I've read many an article and post about making home made vanilla extract. It seemed like a surprisingly easy process and such a fun idea to make my own, insuring extra vanilla-y goodness. So as most every website suggested I bought vanilla beans and some vodka, filled a mason jar with both and waited. Two months. And when the two months had past, the point at which the beans have reached their extracting limits what I had was NOT the vanilla extract I was hoping for. It was disappointingly light in color, and didn't smell like vanilla as had been promised. But rather that settling for lack luster extract, I decided to buy a whole new batch of vanilla beans and double extract for another two month. Success! After four months of patience I finally had a dark, mouth watering vanilla extract to bottle for my friends and family. 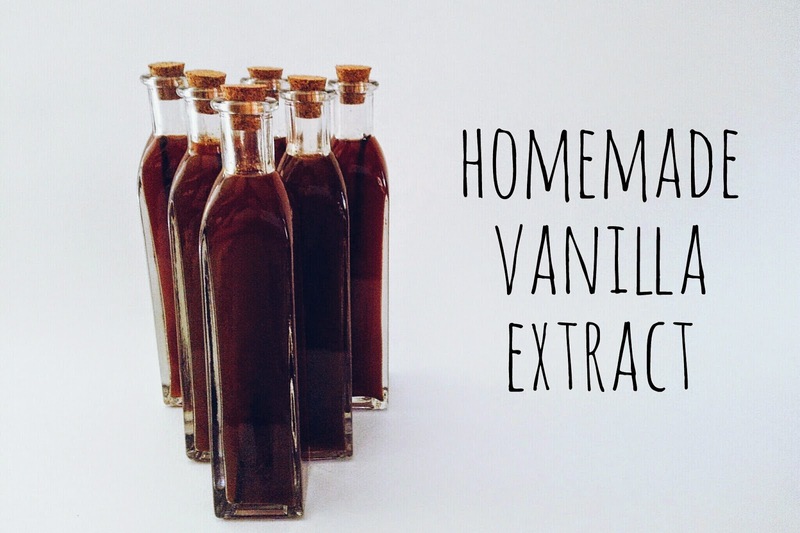 Though the cost of so many vanilla pods and the length of time involved may be off putting for some, there's just something so special about using your own homemade grade A extract in home recipes. 1. Slice 25 pods in half lengthwise and drop into a large mason jar. 2. Fill jar to the top with vodka, and seal tightly with a lid. 3. Shake the jar every few days and let extract for two months out of direct sunlight. 4. After two months remove the extracted vanilla beans. And replace with fresh vanilla beans after slicing in half as in step one, adding them to the extract. 5. After the final two months, remove the beans and bottle your new extract! • you can allow the extracted vanilla pods to dry out and place them in a jar of sugar to make vanilla scented sugar. • the vanilla can be strained before bottling to remove any debris or vanilla beans if desired but I opted not to. • You don't have to purchase all the pods at once. Beanilla offers sales so I bought the first 25 vanilla beans and then a few months later the last 25. Want some ideas to use your vanilla extract? 1. Oatmeal Cookies! Two different recipes here. 3. Chocolate Chocolate Chip Cookies! Chocolaty goodness here.